Located in the heart of the Mediterranean Sea, Italy shares open land borders with France, Switzerland, Austria, Slovenia, San Marino and Vatican City (these two tiny states are inside Italy itself). With 61 million inhabitants it is the fourth most populous EU member state. It covers an area of 301.338 km2 (116,347 sq mi) and has a largely temperate seasonal and Mediterranean climate. Due to its shape, it is often referred to as lo Stivale (the Boot). The capital and largest city is Rome (2.8 million citizens). Italy’s official language is Italian, but English is also quite common, especially in its main cities: Rome, Milan, Florence, Venice, Bologna, Turin, Genoa, Naples, Palermo, Bari. 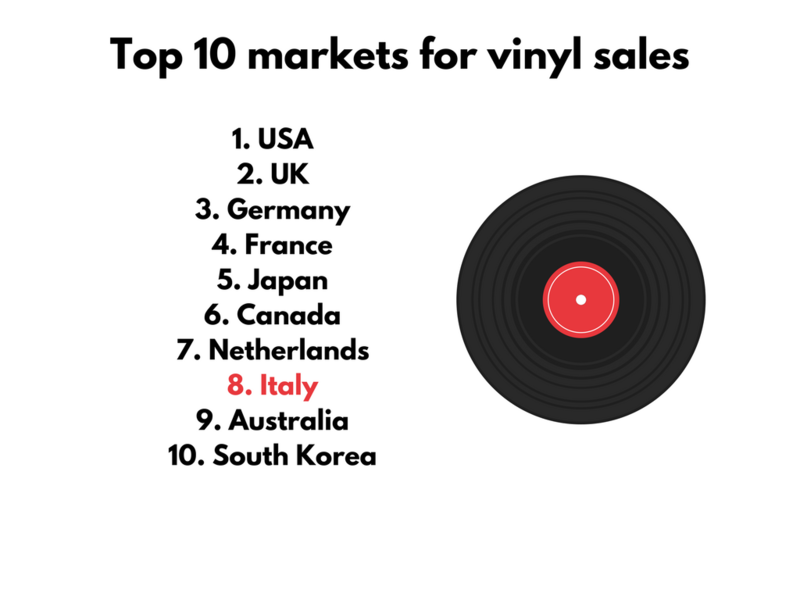 Despite its small geographical size, Italy is an important player in the world music market. 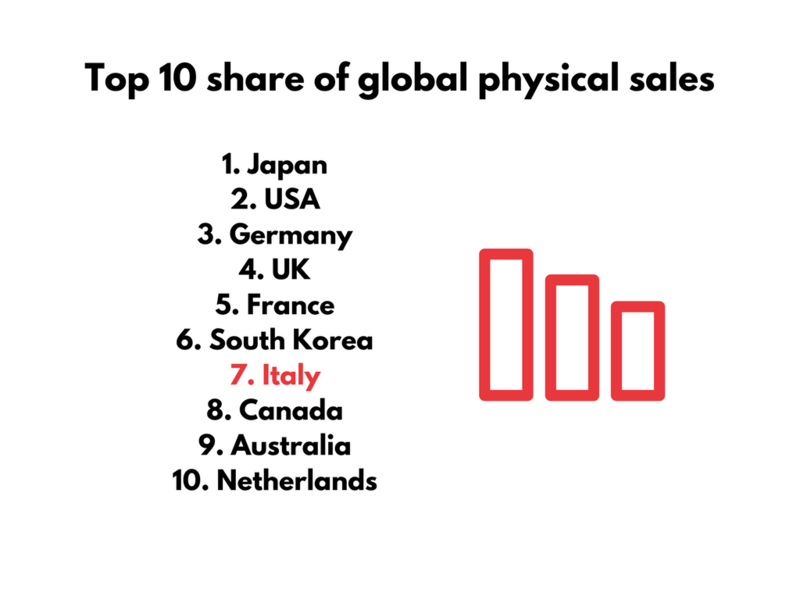 As a matter of fact, Italy is the 7th country in the world in terms of physical sales, performing better than Canada and Australia. 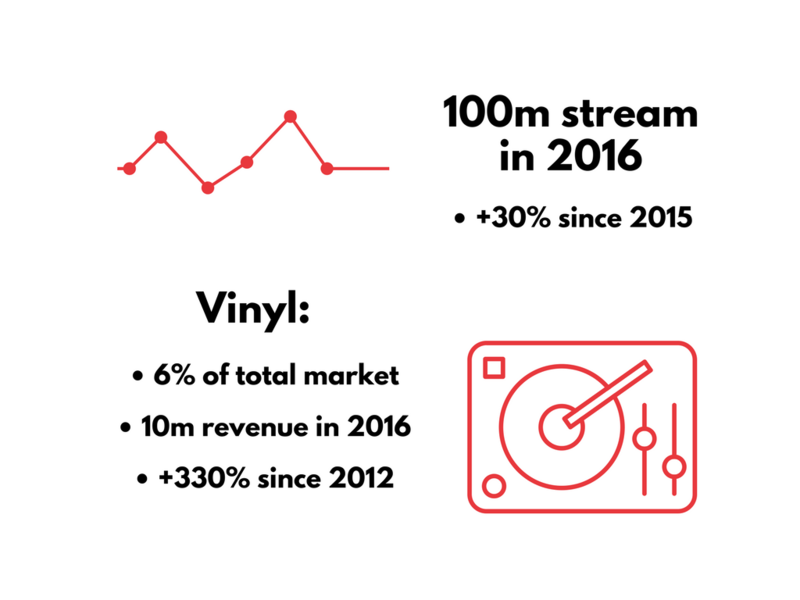 “Italia Creativa” annual report, SIAE’s “Annuario dello spettacolo” and IFPI’s “Global Report” are useful resources to understand Italy’s music business: in 2016, Italy’s vinyl market grew 6% (compared to 4 per cent in 2015), while download revenues were down 23.9%. 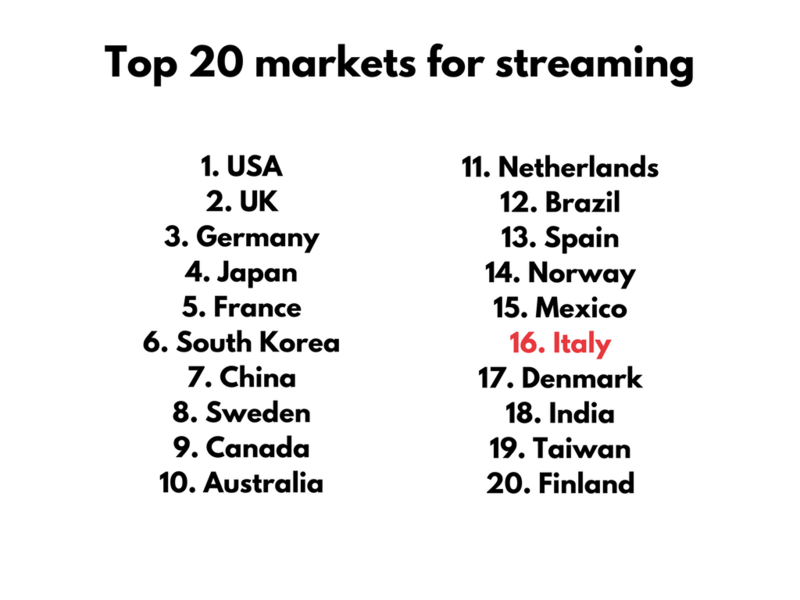 For what concerns piracy, the most common type of piracy in Italy is stream ripping: 85% of young people listens to music using legal platforms, but 45% of people between 16 and 24 rips music from legal streaming platforms such as YouTube. 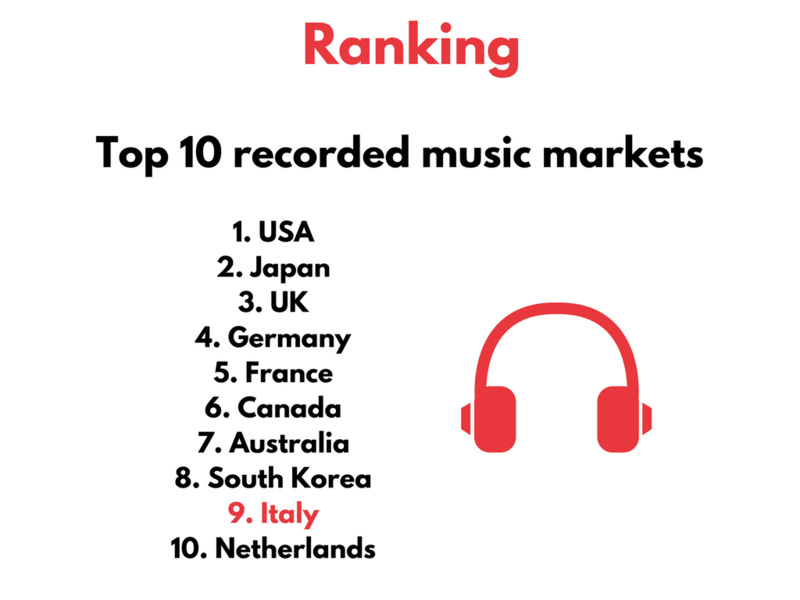 Moreover, according to MUSO’s 2016 Global Piracy Report, Italy is not among the top 10 countries in the world ranked by piracy visits. 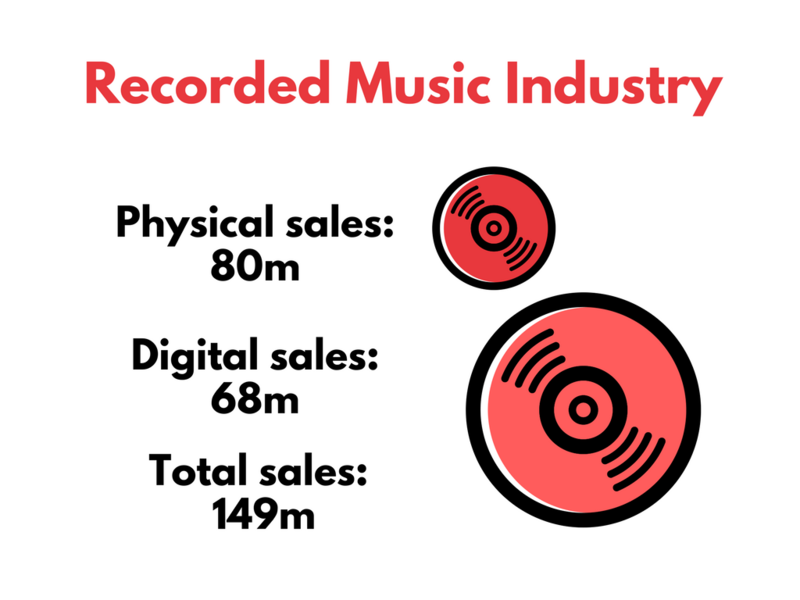 In wider terms, that means the Italian music industry follows the same trends of the global music business. 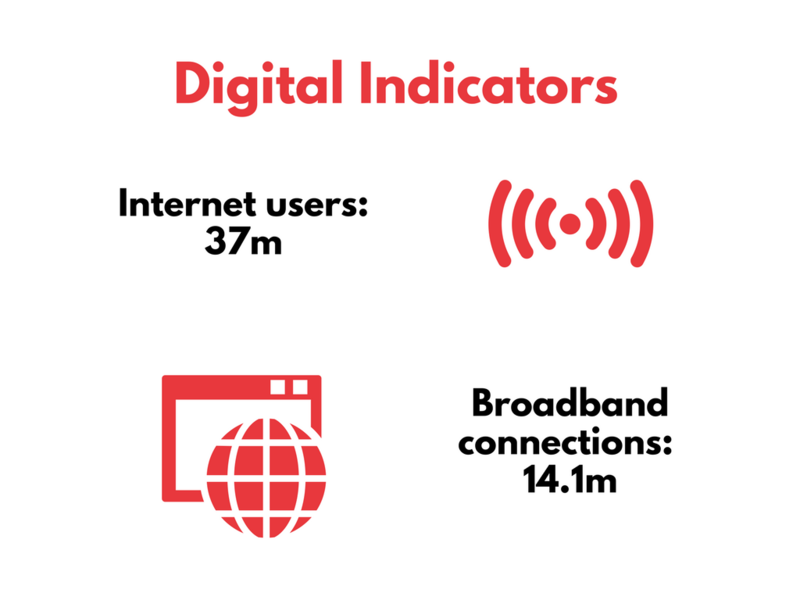 Find in-depth stats and infographics below. 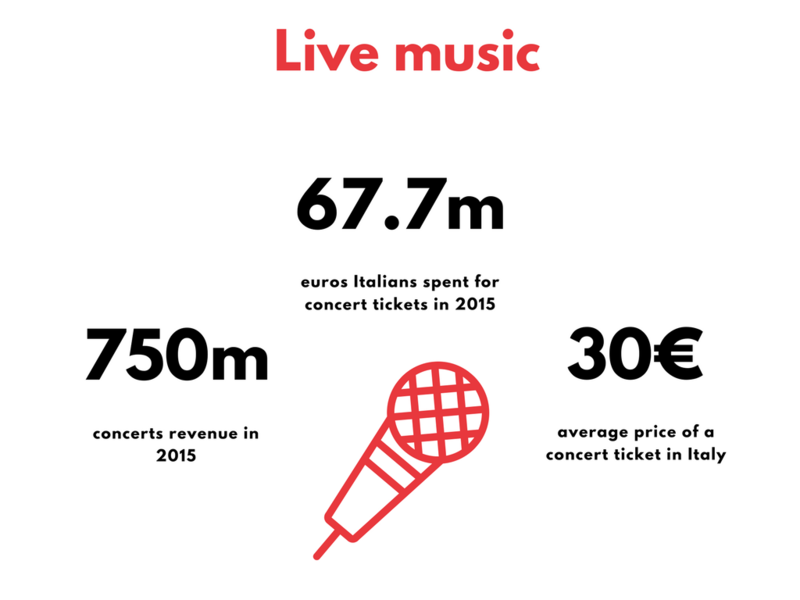 With its 415m turnover in 2015, Italian live music sector is one of the pillars of Italy’s music industry. As it occurs in the majority of European countries, Italy’s live industry is built up of different types of touring circuits, festivals and venues. Small clubs in Italy form an interesting touring circuit which extends both in small and in big cities, in the north and in the southern part of the country, and can be a good starting point to develop an Italian audience throughout the peninsula. These clubs often have limited capacity (50-200 ppl) so they are advisable for artists who can adapt to small fees (up to 300/350€). Most of these small venues are ARCI clubs: ARCI is a popular cultural association to which many Italian music clubs belong. Every member in the audience has to subscribe to the association and pay an annual membership (usually around 5-10€) which will be valid for all Arci clubs around the country. The cost of this membership is usually not included in concert tickets. Another type of grassroots venue is CSA or CSOA, which is to say occupied and self-managed spaces. These venues are run by the neighborhood community and offer a variety of political and social bonding activities. House concerts are relatively common in Italy, and you can find Italian versions of Sofar Sounds and Balcony TV. Main venues in Italy usually have three types of capacity: regular music clubs (up to 3000 attendees), sports venues (“palazzetti”, up to 13k attendees) and stadiums (up to 60k attendees). Most of Italian music clubs are part of KeepOn, a national network representing around 280 clubs all around Italy. Every year KeepOn releases an interesting report about the state of grassroots venue in Italy. From the beginning June to the end of August most of Italy’s indoor club close or move to outdoor spaces. This is the reason why Italy has many seasonal venues that are open & functioning only during summertime, as for example the popular bathing establishment Hana-bi or Parco Gondar in Puglia. Linecheck, Medimex, KeepOn Live Club Fest and MEI are some of the main music business networking events in Italy. From 20th to 26th of November 2017 Milan will be home of Italy’s first Music Week. A whole week of events, conferences and panels focused on music business. Social Security: in Italian called ‘agibilità’ Inps – ex-Enpals (Italian social security and pension funds) has to be registered by the promoter or agent before the show. This tax amounts to 38,17% of the artist fee. Withholding Tax: withholding tax is 30% but can be reduced by dividing the invoice between the fee and the production costs. The maximum percentage of deductible is 60%. The promoter is responsible to declare and pay the taxes. Note: Italy has a tax treaty in place to avoid double taxation. Artistic performance work requires a self-employment/freelance working visa type (D). The cost is relatively low and there are few documents to provide when applying at your closest embassy for the Visa. Note: the processing of the visa will require at least 15 working days. The train could be a very good way to tour in Italy. In Italy there are two train companies: a public and a private one. Ferrovie dello Stato (Trenitalia) is owned by the Italian Government while Italo is a private company. Ferrovie dello Stato offers regional, long-distance and high-speed rail services, whereas Italo offers only high-speed rail services. Travelling through Italy by car or van is easy thanks to a good highway network. All the Italian highways are toll roads. Note: If you play in a city centre venue, it is worth remembering that Italian city centers often have narrow streets, pedestrian zones and pay parkings. Both national (Alitalia) and European wide budget airlines operate flights in Italy. Most major Italian cities have at least one airport within fairly easy reach, and Milan and Rome have at least two airports. Rome is served by both Fiumicino and the more distant Ciampino, while Milan is served by Malpensa, Linate and Orio al Serio. Italy has a total number of 40 airports, that means you can fly close to every city like Bologna, Florence, Turin, Naples, Palermo. Note: In Italy, when you sell a merchandise product you are obliged to leave the customer a receipt that indicates the local Italian VAT and who the seller is. The VAT has to be declared and paid to the revenue authorities. Also the records that shall be sold would have to be legally import and get the import sticker from the SIAE (the national collecting society). If you travel by car, It worth considering the traffic, so plan in an extra 30 minutes. Music promotion in Italian mainstream media it’s not an easy task: as in all markets, the Italian one has its own peculiarities when it comes to promotional campaigns, and while there is little room for new artists on tv, radio and print media, there are some exceptions. Radio, tv, online and print promo in Italy is usually handled by a team of different people in the same company, so the best thing is to find a good Italian partner to work with. Here’s a short guide to Italian media. Online music magazines have gained enormous popularity in Italy within the last 10 years and they have quite an influence on their readership, so it’s important to take this into consideration when planning a promo campaign in Italy. Speaking of global brands, there is an Italian edition of Rolling Stone (which is quite popular, both online and in news stands) and Noisey (VICE Magazine’s music platform). Moreover, there is a number of well-known independent webzines that have been publishing original online content since the late ’90s: among them, the most popular ones are Rockit (only focusing on Italian music) and Rockol, followed by Il Mucchio, Rumore and Blow Up, three historical print magazines that have their own online version. For what concern electronic music, popular online magazines are Soundwall, DJ Mag, Parkett Channel and Clubber Confession, while La casa del rap, Four Domino and Rap Burger concentrate on rap music in all its forms. Dance Like Shaquille O’Neal and Deerwaves have a younger readership and while focusing on music, it’s not unusual to find other kind of articles regarding tv series, sneakers, pop culture or technology. Other popular web magazines include Onstage, Sentireascoltare, Rockon. The online versions of historical daily newspapers such as La Repubblica, Corriere della Sera, La Stampa, Il Sole 24 Ore, as well the Italian edition of international magazines like Wired, Esquire, l’Officiel, Vogue, Vanity Fair and many others also give space to music-related content. As it happens in every country, there are specific web magazines focusing on each music genre, so it’s important to do some research before planning a promo campaign (or you can contact us, and we’ll do our best to help you figure out which could be the best options for you). Considering the growing popularity of new digital platforms, print music magazines in Italy are quite struggling. The most popular music magazines in Italy include Rolling Stone, Il Mucchio, Rumore, Blow Up, DJ Mag, and as it happens for online webzines, there are specific magazines focusing on each music genre. Daily newspapers such as La Repubblica, Corriere della Sera, La Stampa, Il Messaggero, as well as free press publications such as Metro or Leggo all feature music (interviews, reviews etc) and have columns detailing upcoming concerts. The most popular free magazine for what concerns music and concerts is Zero, which is distributed with different, city-specific editions in Rome, Milan, Bologna, Turin, Florence and Naples. Zero can be found in all club, bar, pub, music hall and clothing shop in these cities, and it’s an useful source of information for all music lovers in Italy. Italian television is divided into public and private broadcasters: RAI (Radiotelevisione italiana) is the Italian state owned public service broadcaster, while Mediaset and SKY are the two main commercial tv broadcasters in the country. 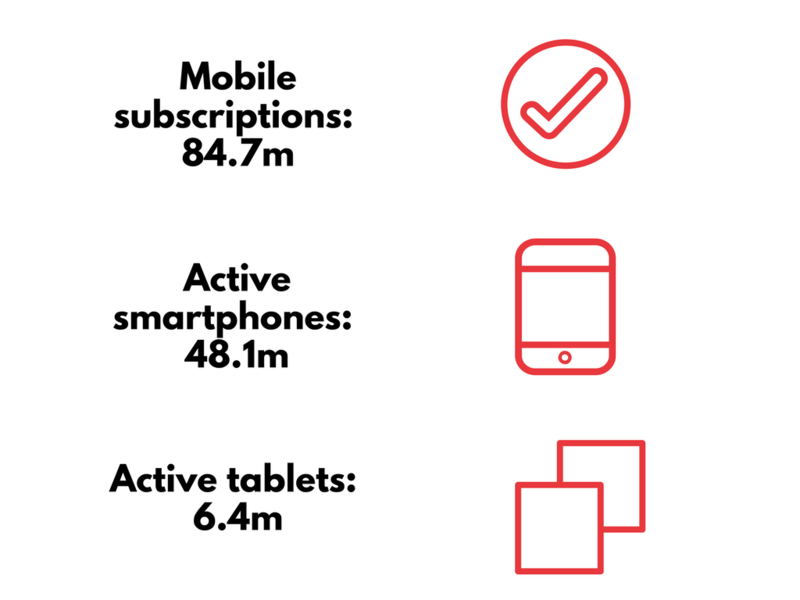 Rai is the national public broadcaster and with its main channels (RAI 1, RAI 2, RAI 3) covers an average audience share of almost 40%. RAI is followed by the commercial broadcaster Mediaset (with the three main channels Rete 4, Canale 5, Italia 1) and Sky, the pay-tv broadcaster home of popular tv shows such as X Factor Italy and Masterchef Italy. Some Italian radio stations have their own TV channel, as for example Deejay TV, Radio Italia and Radio Capital, while there are also ‘traditional’ music channels like VH1 and MTV Italy (part of SKY). For what concerns music tv shows, the most popular ones are X Factor Italy (SKY) and Amici (Mediaset), both talent shows. The most famous music event in Italian television is Festival di Sanremo, a mainstream song contest aired once a year (usually in February) on Rai 1 since 1951. Another popular tv event is Primo Maggio, a concert organized in Rome by labor unions every 1st of May, and aired live by RAI. Finally, there is the Wind Summer Festival, a four-days-show live showcasing summer hits. Several Italian tv shows host brief showcases of independent and new artists, both Italian and international: “Che Tempo Che Fa” (Rai3), the Sunday football show “Quelli che il calcio” (Rai2) and “E poi c’è Cattelan” (SKY) are among the most popular ones.